We are ready for our customers! I woke today to be reminded by Rachel that it was fifteen years ago today that I was awarded my doctorate in glorious sunshine in Princetown, New Jersey. It was a very happy day and Rachel and Mum were with me. Tom collected me at half past eight, I had already walked Mix, and we drove into Berwick to buy bread for the Christian Aid lunch today. Then it was off to Clare’s to collect the tables and chairs and set them up in the church hall. We had to collect things for the meal from the farmhouse and then it was back, as it was last Tuesday, to preparing the meal and setting the tables. There weren’t many people with us today, I suppose it has been a long week but I have been kept going by the fact that every little helps and that if we manage to raise enough money for a few cows we will have made a difference. 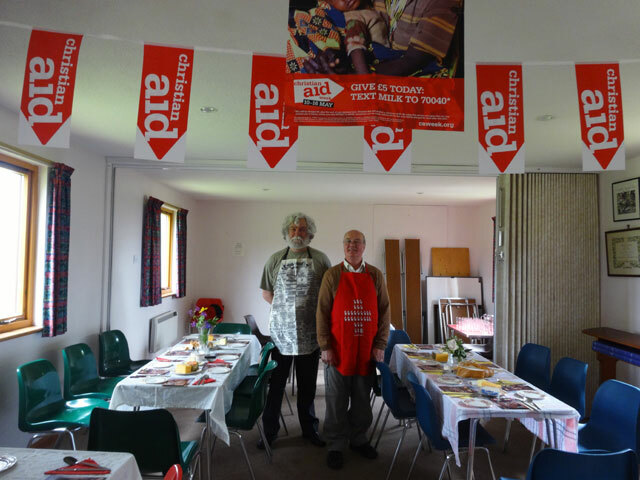 Last year Christian Aid raised twelve million pounds and that huge sum is made up of everyone’s small efforts. In the afternoon there was clearing up to be done and once that was done I returned to Mount Pleasant to discover that Ann and Rachel were in the midst of a kilt-making course, Mum was out at a reading group and Olive was preparing for students. So I leapt back in my car and drove to Chester-le-Street where I watched my first ever live T20 cricket match between Durham and Northamptonshire, enjoying a hot dog and chips while I watched. The game ended early due to rain but not before I had seen the Durham innings and enough of the Northamptonshire innings to ensure that Durham won the match under the Duckworth Lewis rules. I drove north and was home in time to have a snack, watch the News, walk Mix and retire to bed with a book. The days just get better and better.